When the August issue of Bon Appetit arrived in my mailbox several months ago I did what I always do when one of the new cooking magazines arrives—I immediately ripped into it to see if there was anything that spoke to me. Usually this is a fast flip-through, followed by a more thorough examination when time allows. And if I’m lucky, the net result of those two combined searches will yield maybe one recipe that catches hold of my imagination and demands immediate attention in the kitchen. Let me repeat that: maybe one recipe. (The exception to this generalization was Ruth Reichl’s late-great Gourmet, which most months could be counted on to produce a half dozen or more recipes with each new issue—many of which I’m still making today.) I mention all this because that August issue of BA was the rare exception to this rule: an issue that produced not one, not two, but a multitude of recipes—all of which had me conjuring meals and plotting my return to the kitchen as soon as possible. 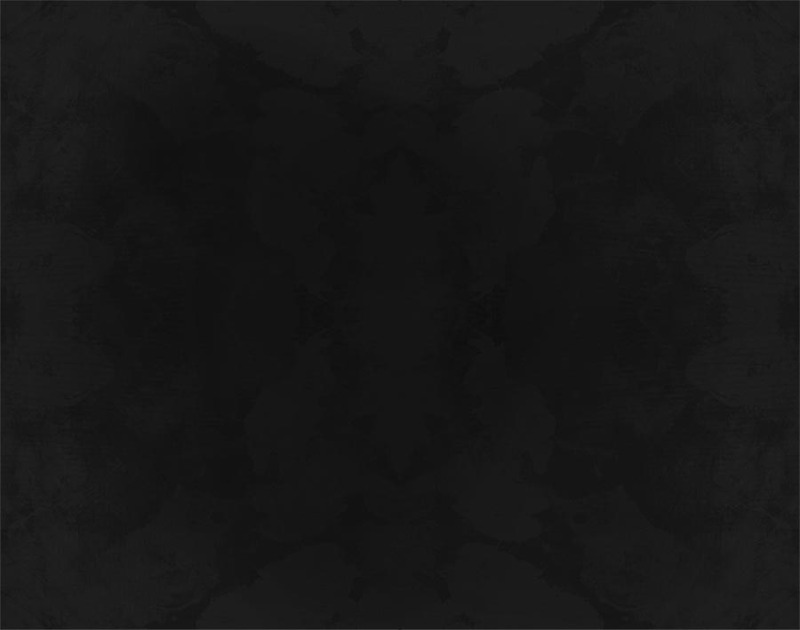 I haven’t tackled them all yet (and probably won’t; there’s always some attrition here), but one that I have made—several times now, in fact—and which seems destined to become a TRG standard, is the recipe I bring to you here. 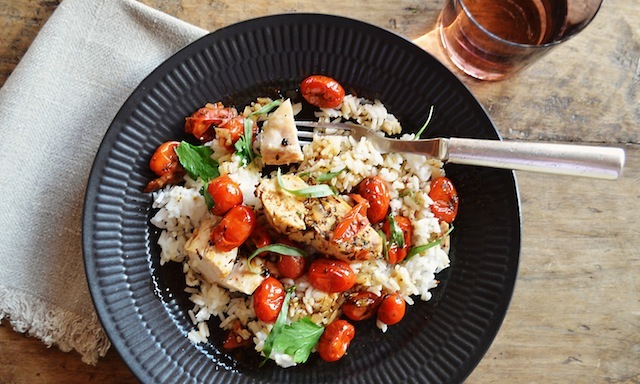 The recipe is for a seared, and then roasted chicken breast, accompanied by a juicy array of herb-roasted tomatoes. In other words, nothing that’s particularly elaborate or time-consuming. Those were two immediate selling points for me, since I’m often challenged by what to make for dinner at the end of a busy workday and frequently solve the problem by ordering in. Here, at last, was an alternative that I could make myself in about the same time it would take the delivery guy to find his way to my door. But perhaps even more enticing was the fact that the recipe calls into play a quantity of Worcestershire sauce and vinegar, and that the completed dish is sprinkled with a small amount of chopped tarragon, all flavors that I love, and in combination promised a zesty contrast to the mellow flavor of the white meat chicken (another favorite). And then there was the fact that the chicken was to be paired with several handfuls of cherry tomatoes, rendered saucy and bright by a quick turn in the oven. Here was a recipe with my name all over it. Or perhaps it would be more accurate to call it a recipe with my name over both halves of it, since this is essentially a dish comprising two distinct parts—the chicken, and the tomatoes—elements that, though they may go exceptionally well together, can also function quite successfully on their own, as well as in a variety of other pairings. 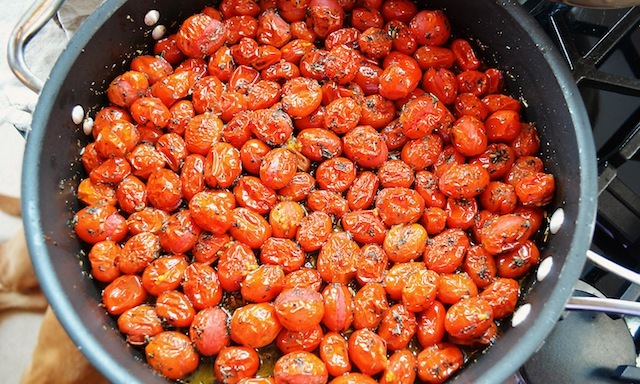 The tomato mixture, for instance, may be the perfect foil for those seared and sliced chicken breasts, but they also prove the perfect partner for pasta, scrambled eggs, or even a piece of toast. That should come as no surprise given that the mixture is the result of first tossing a quantity of tomatoes with some herbes de Provence and some salt and pepper, then exposing the combo to a fast roasting, before splashing the melting results with a tablespoon of Worcestershire sauce. 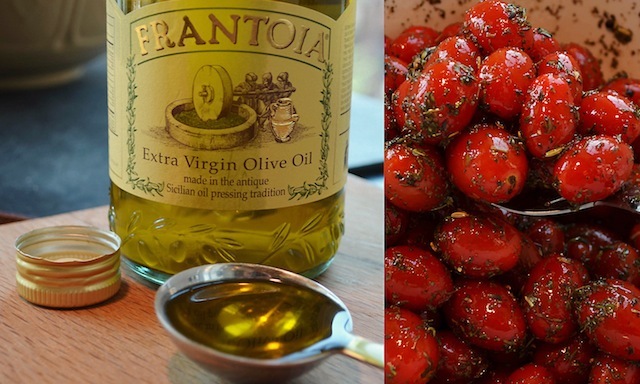 As such, it’s like a zesty, chunky tomato jam, so its potential pairings are endless. As for the chicken, the simple technique here of first searing it (for about eight minutes), and then roasting it (another eight to ten minutes), is a surefire way to end up with meat that manages to retain its all-important juiciness, which as any home cook knows is no small achievement where a boneless breast is concerned. What’s more, the generous sprinkling of kosher salt and pepper applied to the chicken pre-sear assures that the skinless meat will still deliver one of the great pleasures of any chicken eating experience: a little exterior crackle. In fact, I’ve found the method to be both so simple and so reliable that I’ve started using it whenever I’m in need of a fast, foolproof method for cooking chicken, using it once to make chicken sandwiches, and another to round out a meal of leftover pasta. That said use caution with the recipe’s suggested cooking time, as I’ve found 10 minutes in the oven to be more than the chicken needs (which, of course, is one way to eliminate the juiciness that can make or break the dish). You might also consider lowering your oven temperature from 450˚ to 350˚ when it comes time to roast the chicken—I tried this the last time I worked with the recipe and it yielded chicken that was that much juicier, though my oven tends to cook fast so you’ll need to play around here. Still, as fine as the individual parts of this recipe may be, both seem to shine their brightest in the company of the other—a fact that may well have to do with the simple pan sauce that’s assembled once the chicken comes out of the oven, and which seems to pull the entire dish together. It’s here that the red wine vinegar comes into play, this after an additional tablespoon of olive oil is added to the same skillet in which the chicken has been cooked, followed by a small quantity of minced shallot. 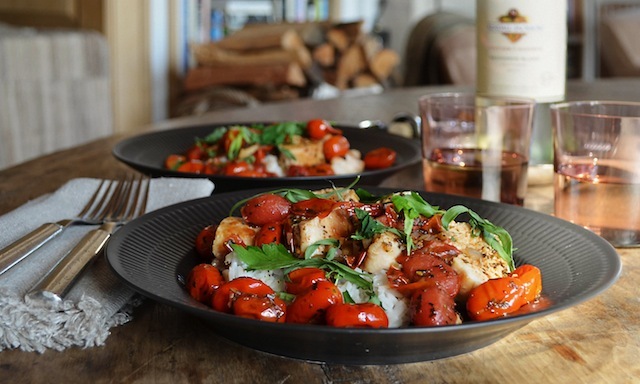 After these two ingredients are given a quick sauté (a minute or so will do it), in goes the vinegar—an addition that offers both a welcome acidic kick, as well as a vehicle for scraping up those tasty browned bits left behind by the chicken—followed a short time later by the roasted tomato mixture. A quick simmer is all it takes to bring these various flavors into a harmonious whole, and to thicken things up to a sufficiently saucy consistency. Slice the chicken, douse with the tomatoes and sauce, sprinkle with the herbs (though about half the amount called for should do it), and you’re good to go. As you’ll note from the photos accompanying this posting, I elected to layer all of the above on a small mound of white rice—in part because I felt the dish needed a little starch, but also because all that wonderful sauce needed an effective vehicle for capturing whatever the chicken and tomatoes didn’t absorb. For me it proved just the ticket, offering the added bonus of some sauce-soaked kernels along with those tender slices of chicken and flavor-packed pockets of roasted tomato. Still, if your goal is to keep things as streamlined and carb-free as the recipe was originally written, a starch free version will be plenty satisfying as well. Just consider doubling the recipe, since as written the quantities are better suited for two than for four—and a meal this good demands second helpings. 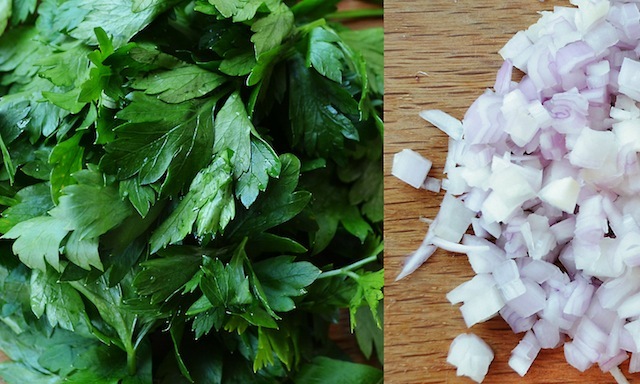 Note: Herbes de Provence, a dried herb mixture (typically comprising basil, thyme, lavender, and fennel, among other herbs), can be found at specialty food stores and in the spice section of most supermarkets. —Preheat oven to 450˚. 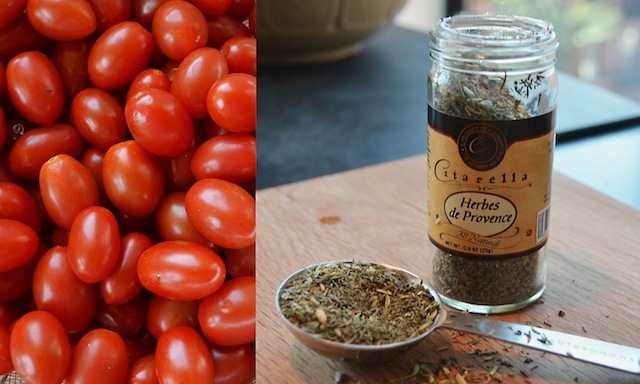 Combine tomatoes, 2 tbs oil, and herbes de Provence in a large bowl. Season with salt and pepper; toss to coat. Heat 1 tbs oil in a large heavy ovenproof skillet until oil shimmers. 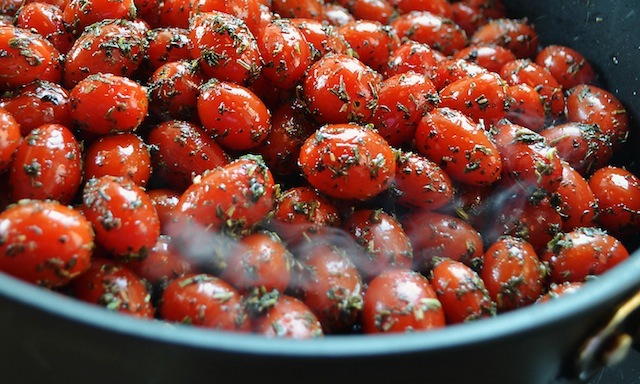 Carefully add tomatoes to pan (oil may spatter). Transfer skillet to oven and roast, turning once, until tomatoes burst and give up some of their juices, about 15 minutes. Transfer to a medium bowl and drizzle with Worcestershire sauce. —Meanwhile, season chicken all over with 1 tsp salt and pepper. Heat 2 tbs oil in a large ovenproof skillet over medium-high heat. Sear chicken on both sides until golden brown, 6 to 8 minutes. Transfer pan to oven and roast chicken until cooked through, 8 to 10 minutes. 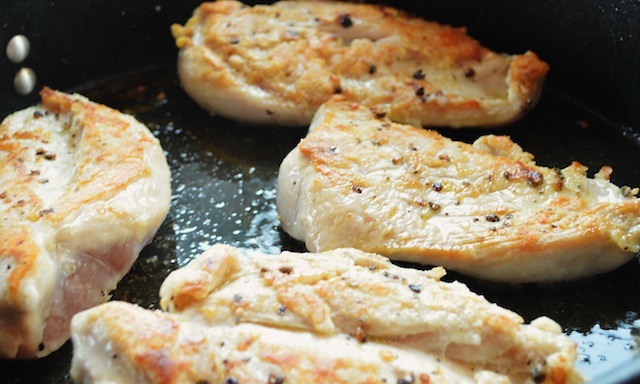 Transfer chicken to a cutting board and let rest for at least 5 minutes. —Add remaining 1 tbs oil to same skillet; heat over medium heat. Add shallot and cook, stirring often, until fragrant, about 1 minute. Deglaze pan with vinegar, scraping up browned bits from bottom of pan; add tomatoes and their juices and simmer until sauce is just beginning to thicken, about 1 minute. 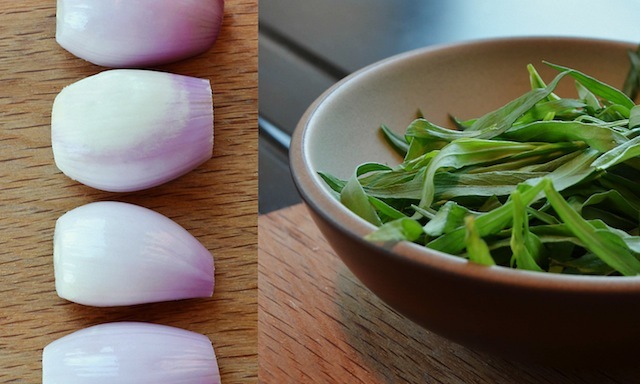 Season sauce to taste with salt and pepper. —Slice chicken; divide among plates. Spoon tomatoes and sauce over; garnish with herbs.